Each Evernote account comes with a unique email address (like ‘myname.12345@m.evernote.com’) which can be used to add content via email. You can forward a message to this address to add it as a note to Evernote. Here, the messages are forwarded by a Google Apps script. This script will run at regular intervals, and read the Gmail labels Evernote and its sublabels. It will forward the last message of each thread that has one of these labels to the Evernote email address. If a sublabel of the Evernote label was attached, it is appended to the subject line with an ‘@’ prefix. Similarly, other labels are appended to the subject line with a ‘#’ prefix. 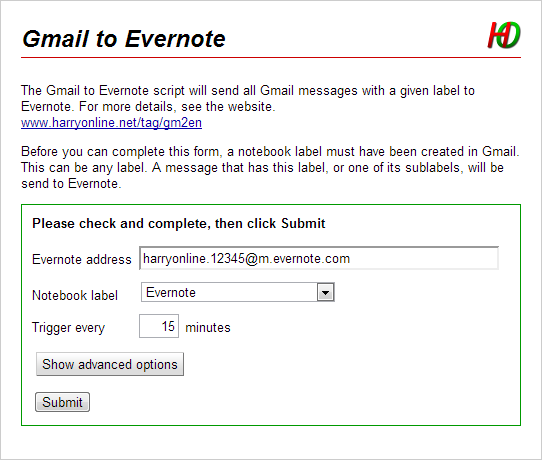 Evernote will read this subject line and place the note in the indicated notebook and attach the given tags. In a Google Docs spreadsheet, a log is kept to record all forwarded email messages. After forwarding, the Evernote label or sublabel is removed, so the messages will not be forwarded again. To make this work, you start by creating the same labels/sublabels in GMail that you also use as tags in Evernote. You don’t have to create all tags, only the tags that you plan to use from Gmail. Also create a label ‘Evernote’, and create sublabels for all notebooks that you plan use. Go to gm2en.com, You may have to authenticate and grant access to the script to run. Select the Evernote label–any message with this label, or a sublabel, will be forwarded to Evernote. Optionally, change the interval with which your mail is checked. Keep in mind that there are quotas for accessing email and use of computer time, so don’t set it too often. If you receive error messages, you may need to check less frequently, and increase the time interval. That’s it. Now, if you assign the Evernote label to any message, within 15 minutes (depending on the time you set in step 4), the message is added to Evernote, and the label removed from the message. You may have to refresh Evernote to see the new note. Click on Show advanced options, to view and change these options. If you have several Google accounts, you may want to distinguish mail forwarded from each account. This can be accomplished using a default tag, e.g. home for your private account, and work for work account. This way, you can keep them separate in Evernote. When an email message is forwarded to Evernote, the script will write a line in this spreadsheet, containing the date, source (including the email address) and message (the adapted subject line). This will be helpful to track errors. The first time, this sheet is created automatically and the ID filled in here. Copy the Log sheet ID from this account to all other accounts. If you use multiple sign-in, the link in the note back to the email may not work; select the number of multiple sign-in accounts that you use, so it will give alternative links that will work. See this post for a more extensive explanation. If you set this value to 0, the link to the message in Gmail will not be shown. Email header fields are added to Evernote. In the note, you can see who send the email, to whom, and when. Other fields are also possible, by changing this line. This is a comma-separated list of the fields that will be shown. By default the value is ’From, To, Cc, Date’. Fields are only shown if they have content, so if there are no Cc-addresses, this header field will not be shown. Other fields that you can include are: Bcc, ReplyTo, and Subject. If you don’t want any header fields, set the value to an empty string, ”. You can configure the CSS style for the header DIV, containing the header fields and the link(s). By default, it is set to ‘border-bottom:1px solid #ccc;padding-bottom:1em;margin-bottom:1em;‘ showing a light-grey line between the header and the message. You can change this value here. If a label is specified here, it will be assigned after a message is sent to Evernote. It must be different than the notebook label, but may be a sublabel of it. You can also manually configure the script. Open the script at gm2en.com/script. All other settings are stored as so-called User properties. To access the User properties, open the script at gm2en.com/script. 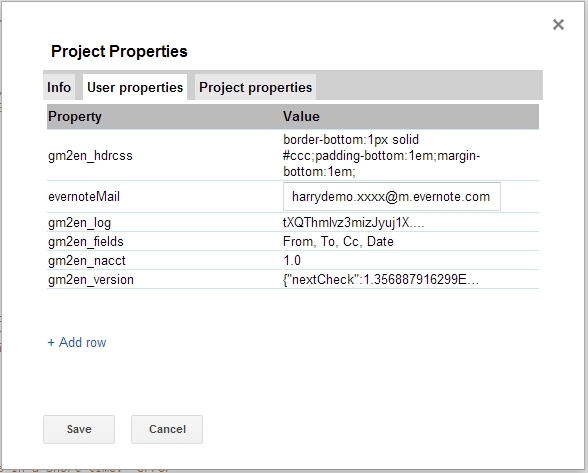 then go to File – Project properties, and click on the User properties tab. Labels in Gmail are assigned to threads, not to individual messages. This script will take the last message of a thread and forward only that message. The Evernote label, or any of the notebook sublabels actually triggers the forwarding. After forwarding, these labels are removed from the thread, to avoid forwarding multiple times. If you assign multiple notebook labels, the message will be forwarded multilple times and placed in each notebook once. If you want to add a remark to an email message before forwarding, you can forward the message to yourself, and add the text, before adding the labels. It is safest to assign the tag labels first, and the notebook label last; Otherwise, it might happen that the script runs just after you added a notebook label, and does not copy the tag labels that you might insert later. Using Gmail filters, you can automatically assign labels to incoming mail. In combination with this script, you can forward message from certain senders or with a given subject line directly to a selected notebook in Evernote, with the appropriate tags. If you encounter any problems in getting the script to work, or have suggestions on how it can be used or improved, please add a comment! This has been so handy over the years, but today the script has stopped working this morning (it ran ok at 6:28am but anything since then is still sitting unforwarded in my @Evernote label). have tried turning it on and turning it back on again, to no avail. Obviously the chances this is not due to a change I have made are infinitesimal, but still, any thought what might have gone wrong? Probably because of the Google Approval process. Google has requested that all apps are extensively documenting why they need certain permissions, in this case the need to read and send mail and to store information on the log file. The process is not going smooth, they are requesting too much for a relatively simple script like this (video documenting the approval process of this script???? ), so I am working on an alternative version that you can just copy and run. Expect this to be launched in a few days.